Floris: Therefore I usually find it good to first approach the upper right, and then invade, making Black overconcentrated: if he plays along, that is. PJTraill: What is the premise of therefore? Some context needed! 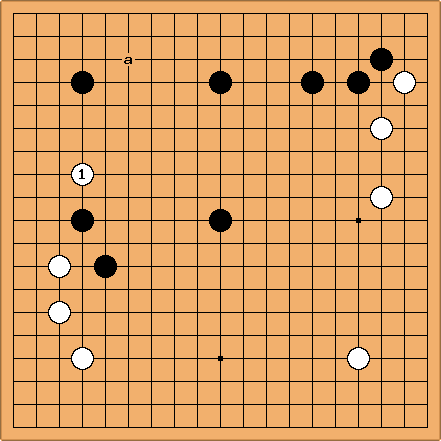 The sequence up to is good for White, makes a and b miai for a base, and in this making Black overconcentrated or reducing his territory. aLegendWai: It is my little opinion. Correct me if wrong. 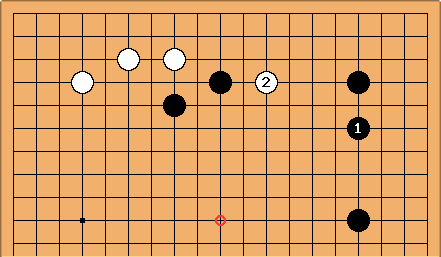 is not good to W. Playing a diagonal play 1 line lower than the opponent's stone along the edge is generally bad. Also a and b are not equal good points. Now B should play at b. (Playing a gives the chance for W to destroy the upper right side. Hardly good in this case). So if Black b, White a, then Black c is a good hane to press W severely. may try to play at d if it wishes to be safe (?). at b/e is possible in some cases but probably not in this case. Black is too strong here. I deem if the 3 B stones on the upper right does not safely guard the territories around, b/e can be good, right? 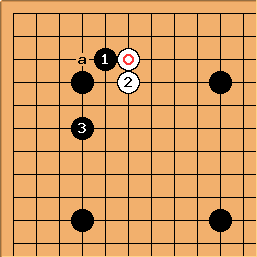 The idea of playing at f is a light play to escape (not for a base). You may consider this as well. But probably bad in this case. aLegendWai: Andre Engels had talked something similar to me. Click on . Mef: Much of this has already been discussed farther down on this page. Actually, Black made a (small) mistake (not wrong in all situations) somewhere, can you spot it? 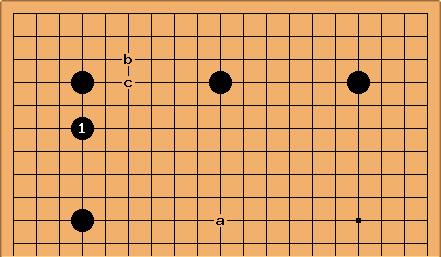 Yes, the not-so-good move is , above it is better played at in the following diagram. Out of all the other pincers puts the most pressure on White. The continuation up to is most usual, except Black will have a huge advantage in the coming fight as White has two weak groups. Notice the black move at tengen is a ladder breaker here and without it is much less severe (makes the cut at impossible). 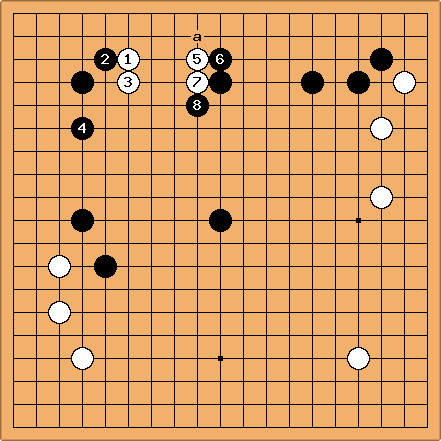 tderz Above diagram follows the same concept as Go Seigen's advice to play - the usually disliked (despised? ; we usually teach kyus not to play like this, but to go out into the center ) here - because Black has a strong environment, hence wants and needs to fight for maximum efficiency. Go lives up by the exceptions! 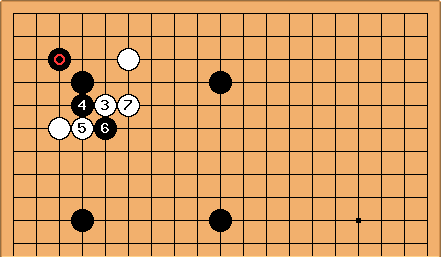 5-5 kosumi out,(because white can at least settle one group easily (e.g. by invading 3-3). Yes, is the very move, critizised in  ! Andre Engels: I very much do not agree with most of what you are saying here. In the diagram that you consider 'better', I have the feeling that is a serious overplay. 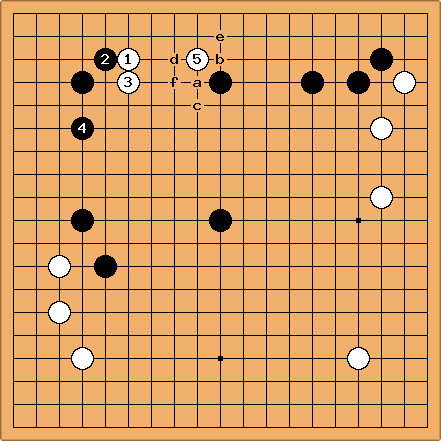 common sense within the context of the fundamentals of Go. It could only be bad if there was something (even) better. Furthermore, White is left with cutting point b and has a hard time to make eye shape - if any. While (ok, more seriously: after) white has taken care of her group), Black has sente to do whatever he likes in the white spheres of influence. In conclusion, the sequence 3-5-7-9 rather gives the impression as if a loose ladder or geta was started - which in the end does not work (ouch!). If anything wrong with the cutting stone in the diagram  in question (which might be possible after all) - then, at least, this diagram here does not seem to prove it (at all). Rather , these moves 3-5-7-9 give a blunt and unimaginative impression. 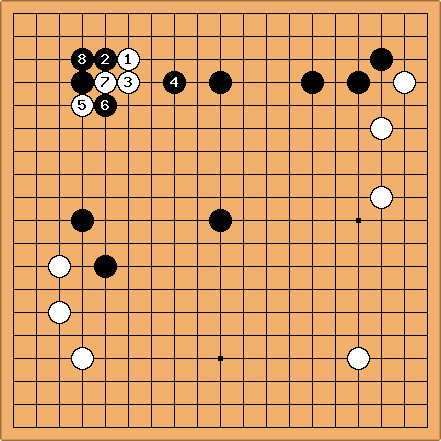 Many lose-looking, vague moves would have much more objective potential than this sequence (my opinion and cf. ). I don't agree that White is left with two weak groups - Black is so strong in this environment to start with, that White should have no qualms about sacrificing one of them. Here you see one possible continuation. Here is another possibility. Black might seem to be doing well, but White a-Black b-White c, killing the corner is hanging above him, like the sword of Damocles. .
Charles Like Andre, I have difficulty accepting these statements. So I doubt that is really a mistake. Also, I don't like the angle play for White here except in a different context. See discussion at Angle play after diagonal attachment. For players who are uncomfortable playing at Black a and allow an invasion at White b, he or she can consider playing at or c instead. Then at a later move, Black can play at a if White has not already played in the vicinity. Yes White indeed lives, but tengen stone really doesn't do much at the moment and Black is fairly overconcentrated in the top right. I suppose a move at a would make it easier to make territory with the tengen stone but then White can take a remaining big point on the board. I cannot call this a good result for White. Black is whistling while solidifying tons of territory as White is fleeing for life. I think is a bit mild, maybe at a is better to put more pressure on White. 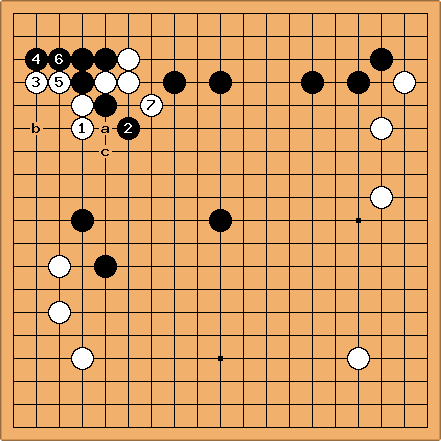 Also, after the sequence you show up here, I think Black b is a very severe follow-up (this would have been even more severe if was at a, but then White wouldn't play ). Sure Black's corner isn't alive yet, but he should first worry about making profit from attacking the two white groups before worrying about the status of his corner. tderz I do not look at all in detail into this matter now (it's late). I do not want to say rightout that is slack. However, my flash impression is that moves like c or (at ) are very often tesuji (one just have to chose the side). 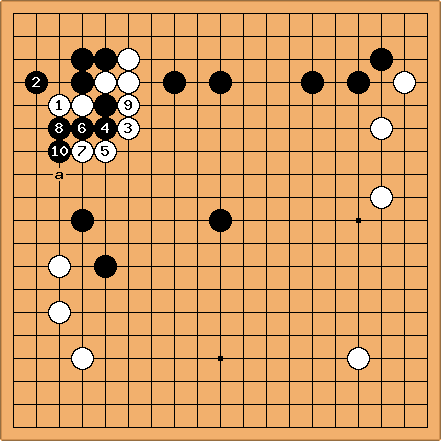 Also a move at a takes at least liberties (ok, also of the own stones, but B is fighting a home game here) and enables much better moves as b. My 1st choice (or thoughts) would be to decide here on either c or . I think for this reason pros tend to like the invasion at better instead of a. Discussed at 4-4 point diagonal attachment joseki. Charles You know, Floris, we can't just accept that Guo is your teacher, she tells you things, you tell us, and we have to agree! OK, maybe I now start to understand. Given this position, the pros just don't add the tengen stone (Black at the circled point). The widest path here is , then to invade. Perhaps what Floris is telling us is an answer to a 'what if?' question. What if Black does make a four star points box formation? That's not so common in pro play - tengen isn't so easy to use. But without any examples for the 'pro invasion' diagram, what can one say? Black's use of tengen here isn't favoured by pros. But amateurs often play it. If White enters a box formation that isn't really well constructed, maybe immediate life might be enough (showing why Black's strategy with tengen wasn't so good). Therefore Black must play a more aggressive way - the requirements of the position dictate it. Therefore, going back to the starting diagram, we could call here questionable. It probably isn't the case that is the biggest point. Black must make sure this stone is used to fight. White has played a strong group plan on the right side. This isn't a case of making Black over-concentrated, though. I see that this position has occurred in a couple of pro games from China. In both cases Black played at a instead of .